In the first post of this mini series I wrote about legacy systems and installing FreeBSD 4.11. The second one shows how to configure the fresh system for remote access, bootstrap Pkgsrc, install Subversion to checkout FreeBSD code and update the system to the stable branch. And part three mainly deals with upgrading OpenSSH and the compilers. This post details some more updates until we reach the final state that’s possible with such an old system (without resorting to extreme means). As a next step we’re going to do two updates. Yes, in theory we could use “bmake update” to update packages. We will not do that. The reason is that we needed to abuse pkgsrc quite a bit so far by mixing package versions from various trees. Since “bmake update” is a destructive command (it will happily uninstall programs as well as packages depending on them!) this can lead to all sort of fun things like unresolvable dependencies and such. If you like pain, go ahead. I’ve been there and I can confirm that it does work for some packages. For a lot of them actually. But in those cases where it doesn’t, it tends to do so much damage that you’re better off starting over than trying to fix things… That’s why I’ll show you a safer method instead: Build a package and update via pkg_add! Also it really starts to show how old the system is that we’re trying to build rather new packages on. More and more of them require some trickery to persuade them to build – but hey, we’re doing a gross thing here, anyway. So there’s no real reason to complain! 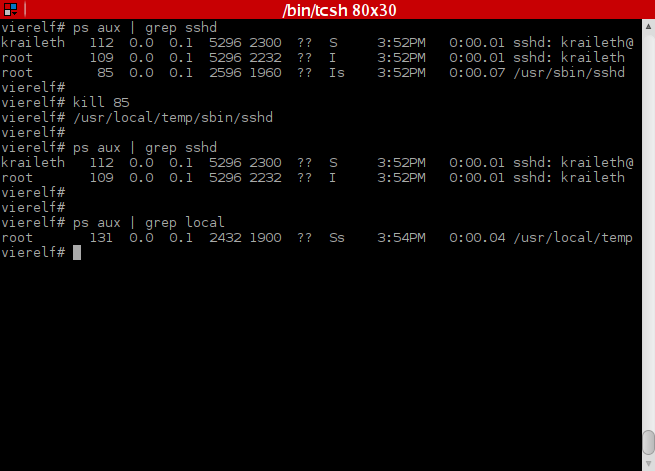 FreeBSD 4.11 running a newer OpenSSH than my FreeBSD 11.0 workstation! FreeBSD 4.11 is really, really, really old now. But you can get surprisingly far in running somewhat modern software on it – more recent software at least than I initially thought would be possible! And you? What was your bet? Would you have guessed that I’d make it up to the 2016Q4 pkgsrc tree and even install the latest version of OpenSSL and OpenSSH? Not too bad, eh? The notable exception here is binutils. Newer versions would probably be possible but there’s a gap in pkgsrc – which stuck with 2.17 for a long time and then directly moved to 2.22 which no longer builds on FreeBSD 4.11. GCC 4.5.3 does build BTW but something goes sideways and the comparison of stage 2 and 3 fails for quite some files. I’ve met my initial goal to provide a newer version of OpenSSH, surpassing all expectations that I had. There’s room for more of course but that’s not worth another post. I’m going to add sudo and since Python 2.7 can be built it might even be possible to manage the 4.11 servers using salt-ssh (the ordinary SaltStack doesn’t work as it requires ZeroMQ which looks like it cannot be built)! We have a recent version of bash and can thus do some pretty nifty things with the right .bashrc. This whole adventure took far longer than I had anticipated – a bit over a month instead of the intended two weekends! But that was mostly because I decided to start over with a clean system several times to ensure that everything works as I wrote it down here (and because GCC4 simply takes so long to build on the only spare machine that I had for this…). 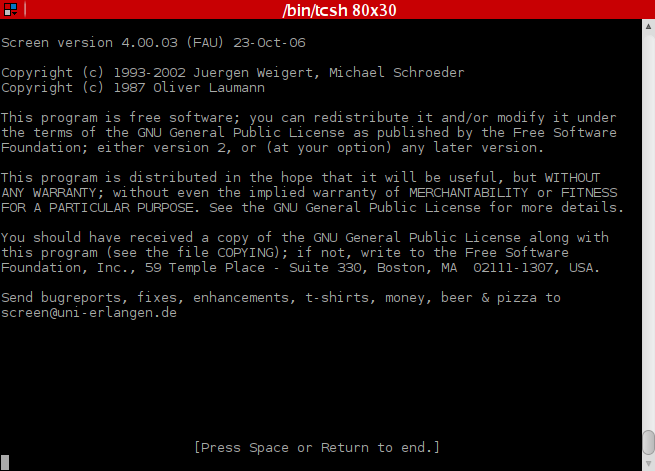 But it has been an interesting ride and I don’t regret spending some time on the legendary FreeBSD 4.11! Oh, and my special thanks to everybody involved with Pkgsrc! I usually don’t have much use for NetBSD but Pkgsrc is extremely useful. I might use it in the future on other systems (like Linux), too. And thanks to you for reading. I hope that you enjoyed it as well! The first post of this mini series was about legacy systems in general and about what installing the old FreeBSD 4.11 is like. In the second one I showed the initial configuration of the system, how to SSH into it despite the obsolete DSA host key and how to bootstrap pkgsrc, NetBSD’s portable ports tree. I also covered the installation of SVN, checking out of the 4.11-STABELE code and updating the system. This post will cover installing newer software. There’s no modern pthreads available on 4.11. Game over. We’ll have to do with very old system headers missing a lot of what we take for granted today. Game over again. Sorry, that ancient libc that we have on our system doesn’t provide that symbol. Game over yet again. How far do you think can we take it in building and installing more recent software? Make a guess now and see if you were right! To be honest I was not expecting the end result. Not at all. So let’s get back to work! If you don’t know screen do some reading because you will want to start using it (or rather the superior tmux). It basically allows you to detach from a session and reconnect later – and your programs will continue running on the remote system even while you’re logged out. You can also resume the session from another terminal or computer, share sessions, etc. And that’s just one of the things that it does. There are other features like allowing you to have multiple shell instances in just one terminal between which you can switch back and forth (think tabs of a browser) and a lot more. Should you not like this (what’s wrong with you?! ), fine. Don’t install screen. It’s optional. This does return one process – and trust me it’s actually our new sshd. What’s happening here is this: The output of ps is truncated because more wouldn’t fit on the screen. And only that data is handed to grep! So the process with the name /usr/local/temp that we found (see the screenshot above) is actually /usr/local/temp/sbin/sshd with the last part of it cut off… This is why grep doesn’t find “sshd”. There’s a funny way to fix this, though: Maximize your terminal emulator so that more space is available. Then grep will find sshd! 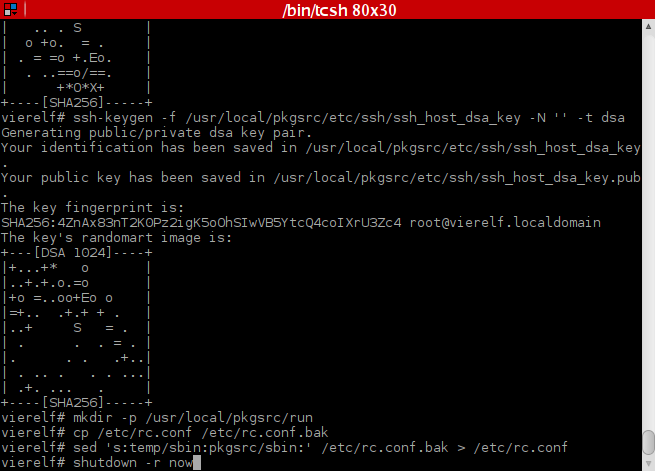 Since we also have a more recent OpenSSH now, we can checkout a newer copy of pkgsrc from CVS! That takes a while, be patient. Even after it is finished downloading (and you see no new lines on the screen) it will still take some time to clean things up. This is normal and you have to wait a little longer. Don’t CTRL+C it as that would leave your tree in bad shape! Thanks to the newer SSH: CVS works now, too! 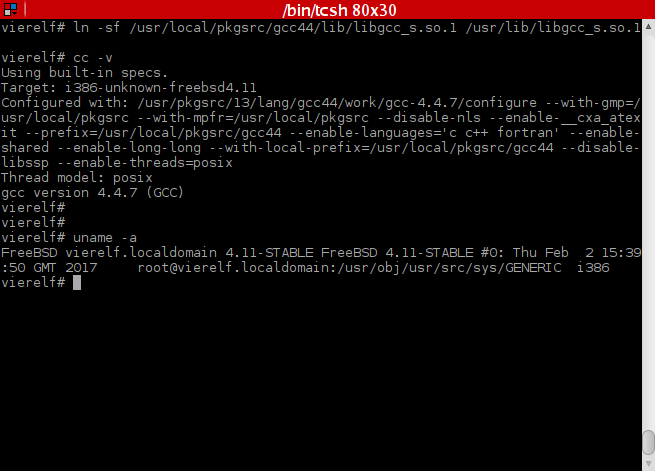 Yes, we really have GCC 4.4 running on FreeBSD 4.11! While it’s certainly not a modern compiler, it’s recent enough to build a lot of software. The latest release of OpenBSD, version 6.0 released on September 2016, still comes with GCC 4.2, BTW! Yes, OpenBSD maintained that all the time and heavily patch it. 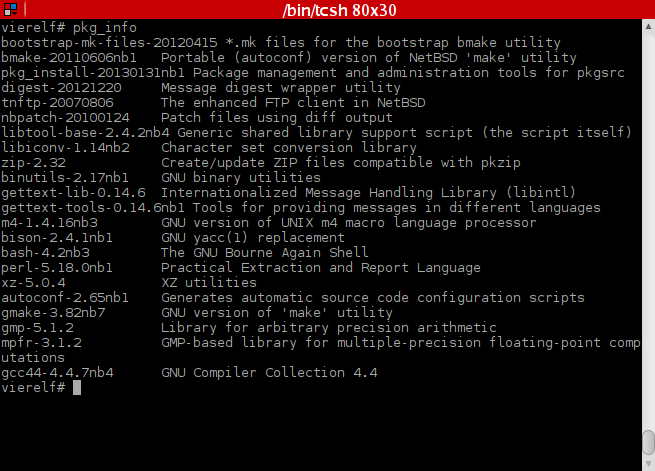 Still we now actually have a compiler available on FreeBSD 4.11 from 2005 which is two major versions newer! With this we’re kind of back in business. But this post is already becoming quite long and for that reason I’m putting the “grand finale” off to one more post. See you there for the final outcome of this “little” experiment (which I hadn’t intended to write more than three posts for, but there you have it).